It’s been a long day. We didn’t get back to our hotel until 10pm. 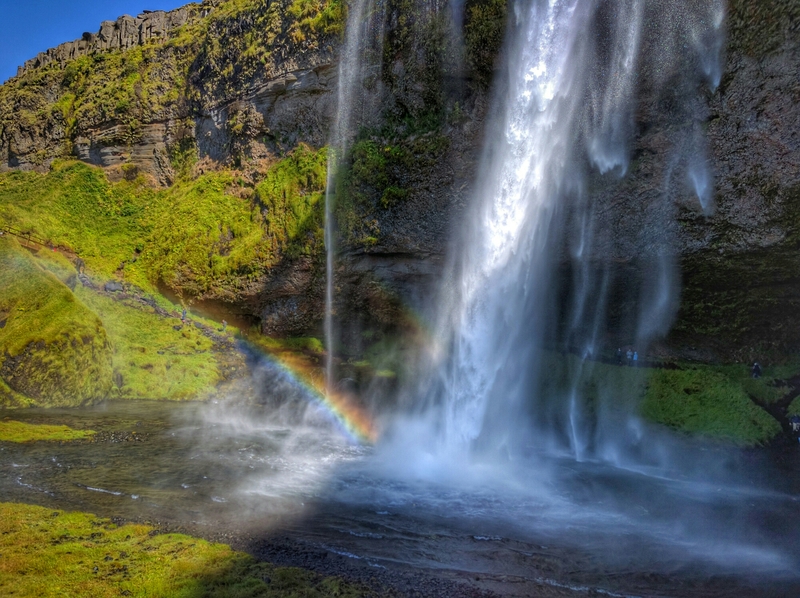 We had a lot of driving to get to Vik in Southeastern Iceland, stopping along the way at two waterfalls (Seljandsfoss and Skogafoss). 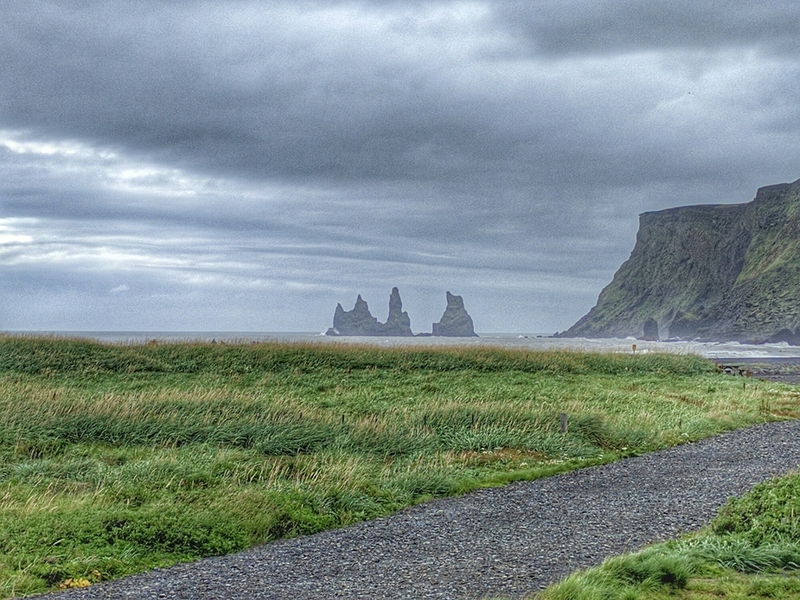 Vik is a small village located at the tip of Iceland, with some dramatic scenery, including some “sea stacks” , black sand beaches and dramatic scenery getting there. 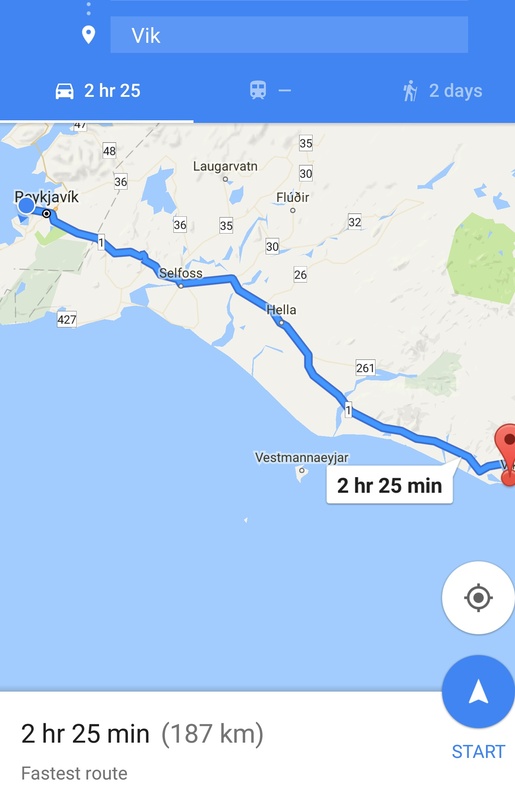 We’ll talk about Vik later, but the road to Vik takes us part way around Iceland’s “Ring Road” a road the circles the entire island. Though it circles the island, it’s not always within sight of the ocean, though it’s not far away. Leaving Reykjavik, we traveled out in a southeast direction. Once outside the city, the landscape became intensely volcanic, with the two lane highway bisecting lava fields. The lumpy rolling lava fields extended for miles on each side as we gradually climbed in altitude. My ears popped a bit as we made our way up, then down. Further in, we saw some small classic style cone shaped volcanoes, but there were larger ones on both sides of the road. As we moved further southeast, the landscape became more green. There were fields where sheep grazed in nice grass, and elsewhere, where there were mountains, you could see them grazing up the slopes where there was more vegetation when the fields below were rocky. Most of these fields were fenced, unlike the open ranges we saw yesterday. The farmers are obviously in full swing with bringing in their summer hay, as some fields had many hundreds of round bales, wrapped in plastic-most of it white, but occasionally black, even pink! Some farms had their bales stacked up two stories tall. The contrast in landscape was significant at times, transitioning from a highly volcanic landscape littered with lava flows, huge boulders cast out into the fields, broad flat rivers carrying the snow and glacier melt down to the ocean through black ash and lava rock, while at other points, there were large fields with grazing sheep and horses (lots of horses here in Iceland). 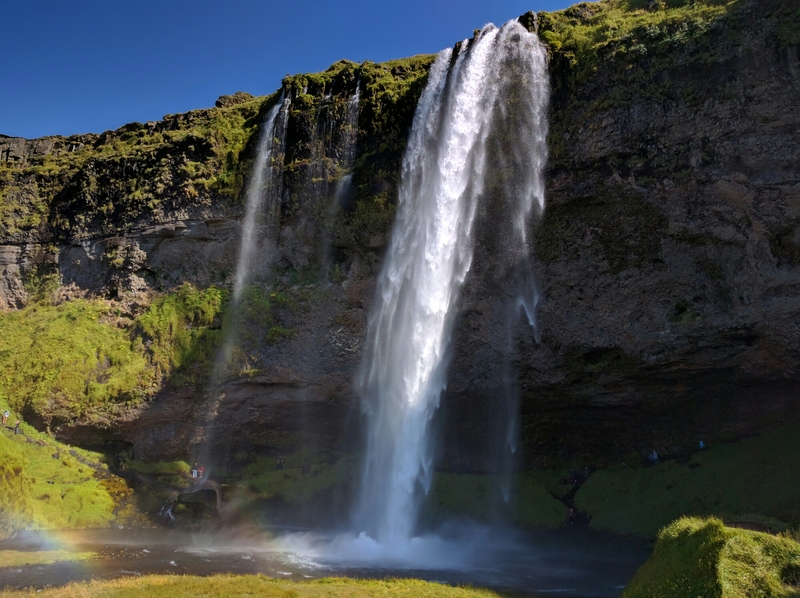 Our first stop was at the waterfall Seljandsfoss, which was at the end of a large ice-capped volcano. The waterfall is such that you can walk in the cavity behind the falls. It’s really wet and slippery and a bit treacherous walking over the rocks. Aside from this main waterfall, there are several other smaller ones down to the left. Leaving the cavity behind the falls, you descend down a slippery rocky path to a long set of steps. The views are spectacular, but it’s a bit hard to keep your camera / lens dry as the spray from the falls hits you from the time you start up one side, walk behind it and climb down the other side. I needed windshield wipers for my glasses. Off to the right of the falls, there’s a trail leading a fairly vertical climb (we didn’t make) up to a small cave. Leaving Seljandsfoss, we got back on S1 (Ring Road) and headed towards Vik. We passed another falls we wanted to see (Skogafoss) but decided to hold it for later if we could, as Vik was still quite a ways ahead. We arrived at Vik about 4:30pm after climbing over and though the dramatic scenery of the winding road that cut though a valley of volcanoes. Vik itself is a small village on the coast. It gets a lot of visitors though, as there is a nice looking Icelandicair hotel across the road from where we parked. 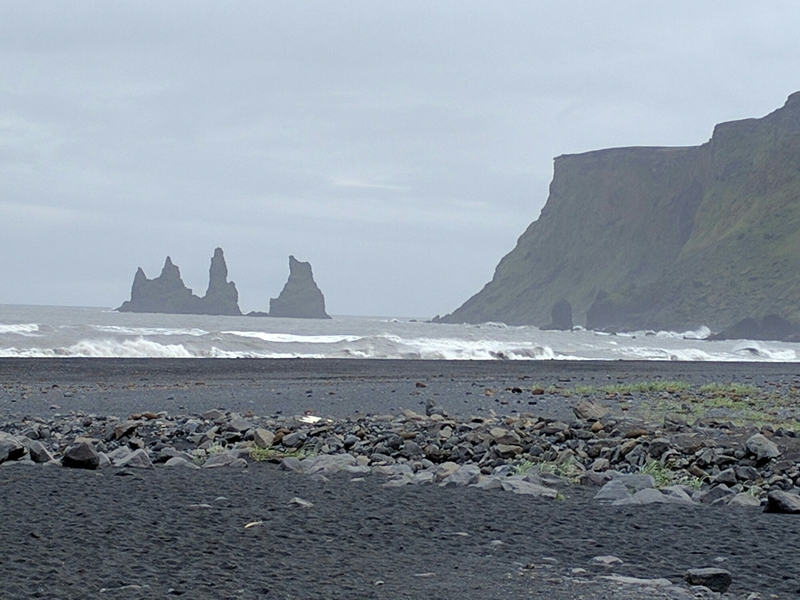 We walked down to the beach though fine black volcanic sand. In the distance you could see the sea stacks and the cliffs to the right. We walked down to the beach through the tall seagrass along the path. There was a small river coming down from the mountains behind us, emptying into the ocean. Here at the beach, it’s windy and cold. Behind us, up on a hill, is the church. Naturally at a place like this, there is a store selling souvenirs, so we helped the Icelandic economy a bit. You know, it would make me feel better if they devalued their currency by a factor of 100. It’s all in the exchange rate, but when the bill is ~17,000 ISK (Icelandic Kronur), it’s like, how much?! ($145), Oh, well, OK. While we waited, a small vehicle pulled in to gas up. They’re prepared! 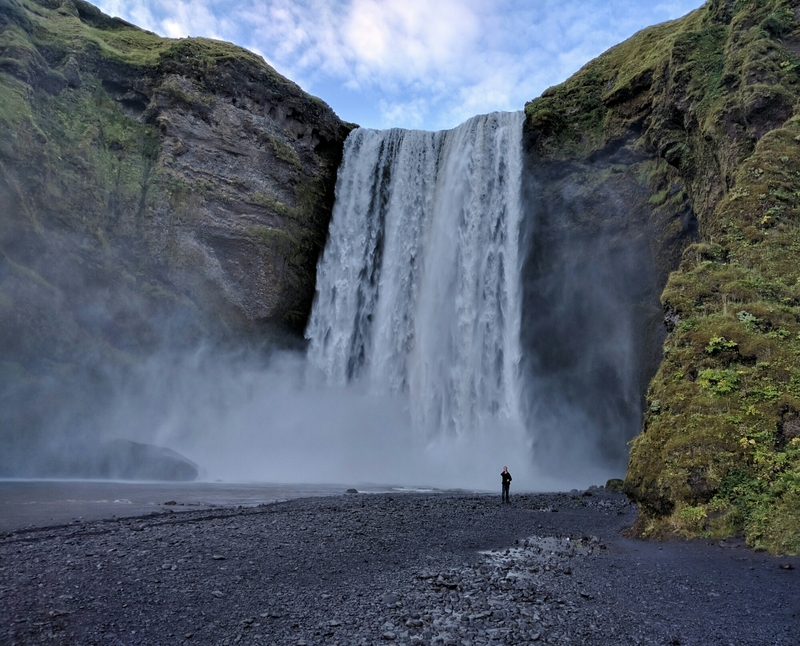 We left Vik and hoped to have time to stop at Skogafoss on the way back. We were surprised when we drove in to find that there’s also a campground here and there were quite a few people with tents set up, cooking dinner and getting prepared for the night. 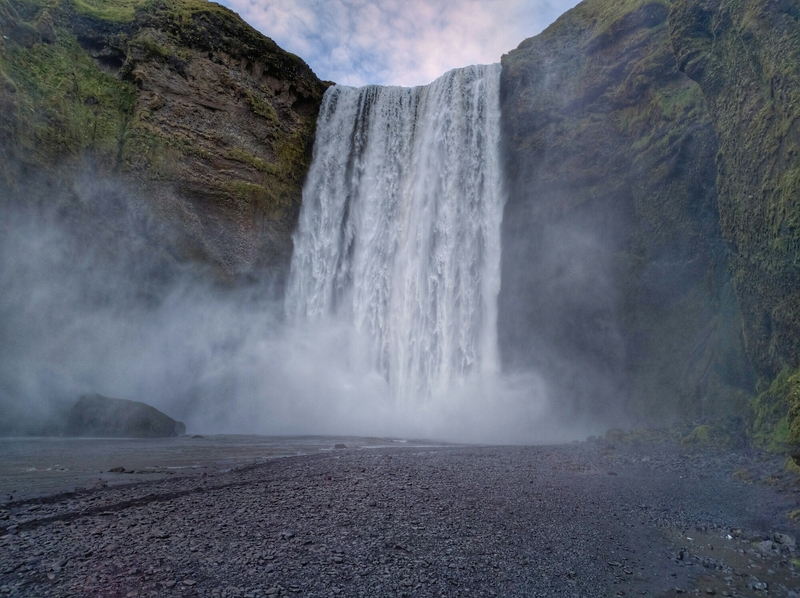 Skogafoss is unusual in that you are able (depending on how wet you want to get) to get very close to the falls. We left Skogafoss about 8:45pm and it was still light, but we have almost 1 1/2 hrs of driving ahead. The road here is mostly long and straight. Except for passing through the occasional town, the speed limit us 90km/h, though some people go faster than that… The benefit of the straight road is being able to see far enough ahead to pass that camper van going less than the speed limit. 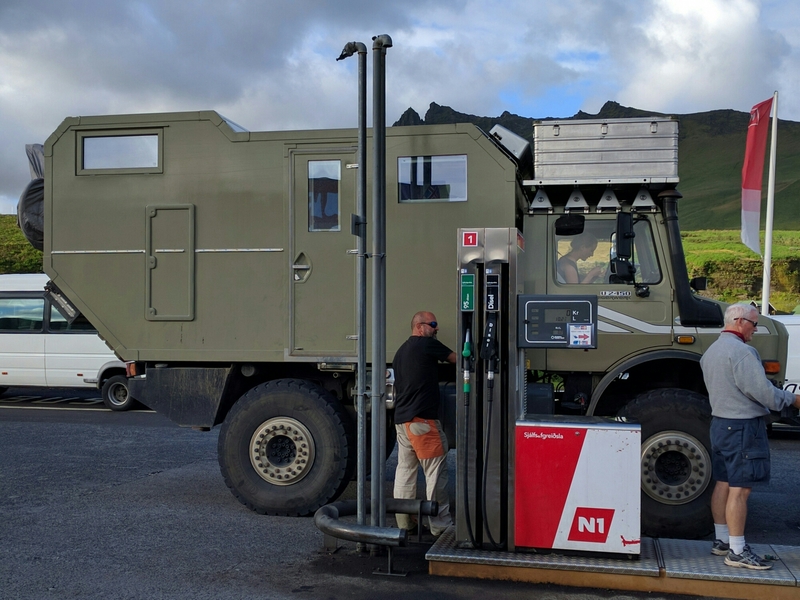 As it turns to dusk and we make our way back into the area about 45 minutes outside Reykjavik, we see something we hadn’t noticed when we came through in full daylight. There are numerous plumes of smoke coming from all around. There are no factories here. This is geothermal steam coming up from the ground, and there’s a lot of it to be noticed at dusk. 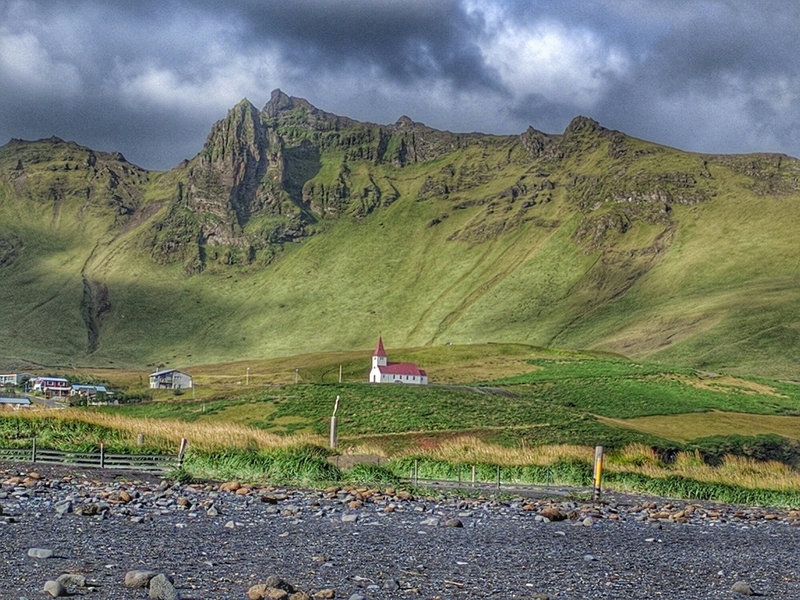 Iceland is a land of contrasts and endless varieties that we’ve hardly explored. There’s much more to be seen up north and in the highlands. Not sure how much time we’ll have for that in our few remaining days, so we may have to come back!